Xarelto (rivaroxaban) is an oral anticoagulant drug, or blood thinner, that was initially approved by the FDA in 2011. It is used to reduce the risk of stroke in patients with non-valvular atrial fibrillation (heart rhythm disorder). Xarelto is also approved to help reduce the risk of and to treat blood-clotting issues associated with deep vein thrombosis (DVT) and pulmonary embolism (PE). Has Xarelto Been Widely Prescribed? Since its release, Xarelto has generated considerable income for its manufacturers. In fact, in its first year alone the drug generated $431 million in European sales for Bayer, while it generated $239 million in the United States for Johnson & Johnson. Current sales of the drug are estimated at around $1 billion worldwide. Despite the incredible success of the drug, the potentially devastating side effects of Xarelto, namely severe gastrointestinal bleeding, cannot be ignored. At Scovern Law, we believe that drug manufacturers should not be allowed to profit off medications that cause serious injury and death to its users, and we want to help you take action against the manufacturers of Xarelto. At Scovern Law, we believe that when drug companies fail to disclose devastating side effects to users, they need to be held accountable when their products cause serious injury or death. We have taken on some of the largest pharmaceutical companies in the industry, and we have the resources and the experience to provide you with the best possible representation if you or someone you love has suffered because of the side effects of Xarelto. A warning was also added indicating that an antidote for Xarelto is not available, putting patients at risk of severe bleeding. A year later, after expedited review, FDA expanded the approved use of Xarelto to include the treatment and prevention of DVT or PE beyond hip or knee replacement surgeries. 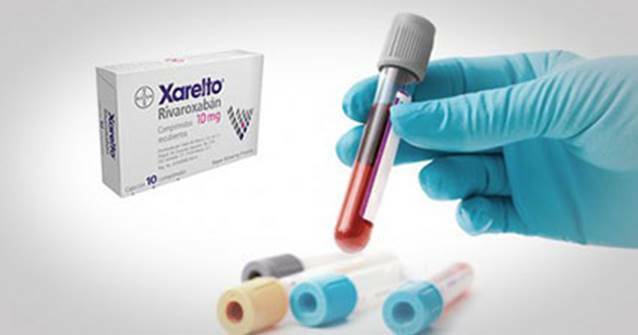 Additional warnings were added to the Xarelto safety label in August 2013, indicating that stopping the use of Xarelto prematurely can increase the risk of thrombotic events, or blood clots. A warning was also added that Xarelto is not recommended for patients with prosthetic heart valves as the safety and efficacy of Xarelto has not been studied in that patient population. Another warning was added to the Xarelto label in January 2014, including that the drug could increase the risk of an acute pulmonary embolism “in hemodynamically unstable patients or patients who require thrombolysis or pulmonary embolectomy.” Following this addition, an FDA committee denied the drug manufacturer’s request to add the treatment of recent acute coronary syndrome (ACS) to Xarelto’s list of primary uses due to lack of data from the drug’s original clinical trials, among other issues. Another safety label addition in February 2014 included the study results of Xarelto along with multiple doses of the antibiotic erythromycin in patients with poorly functioning kidneys (renal insufficiency). The study suggested that patients with these conditions may have an increased risk of bleeding. For more information you may also see our Facebook page. If you or someone you know has been affected by Xarelto and would like to know how Scovern Law can represent you, please don’t hesitate to contact us to review your case and submit a claim at 1.888.725.1890. Our law firm handles cases throughout the entire United States including: Alabama, Alaska, Arizona, Arkansas, California, Colorado, Connecticut, Delaware, Florida, Georgia, Hawaii, Idaho, Illinois, Indiana, Iowa, Kansas, Kentucky, Louisiana, Maine, Maryland, Massachusetts, Michigan, Minnesota, Mississippi, Missouri, Montana, Nebraska, Nevada, New Hampshire, New Jersey, New Mexico, New York, North Carolina, North Dakota, Ohio, Oklahoma, Oregon, Pennsylvania, Rhode Island, South Carolina, South Dakota, Tennessee, Texas, Utah, Vermont, Virginia, Washington, West Virginia, Wisconsin and Wyoming. Our law firm also focuses on handling lawsuits in the following cities: New York, Los Angeles, Chicago, Houston, Phoenix, Philadelphia, San Antonio, San Diego, Dallas, San Jose City, Detroit, Jacksonville, Indianapolis, San Francisco, Columbus, Austin, Memphis, Fort Worth, Baltimore, Charlotte, Boston, Seattle, Washington, Milwaukee, Denver, Louisville, Las Vegas, Nashville, Oklahoma City, Portland, Tucson, Albuquerque, Atlanta, Long Beach, Fresno, Sacramento, Mesa, Kansas City, Cleveland, Virginia Beach, Omaha, Miami, Oakland, Tulsa, Honolulu, Minneapolis, Colorado Springs, Arlington and Wichita.